The Ultimate Dining Card. 10+ Restaurant Brands, 1,000 + locations, ONE Gift Card. CAA Members save 5% on the online purchase of The Ultimate Dining Card and get free standard shipping (value of $3.49) when you enter your CAA Membership number at checkout. Use The Ultimate Dining Card at any of the following restaurants to get even more savings! Montana's Kelseys East Side Mario's Fionn MacCool's Harvey's and more. *Valid CAA Membership required per order. No cash value. Cannot be combined with any other offer or promotion. 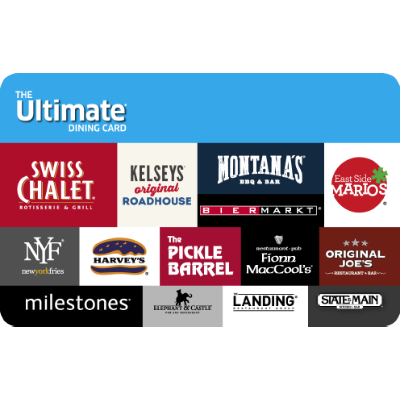 5% discount applies to online purchases of the plastic Ultimate Dining Card® at www.theultimatediningcard.ca with free standard shipping (up to a maximum of $3.49). Discount not available for gift card purchases made in restaurant. Limited time offer. Valid until December 31, 2019. CAA and the CAA logo are trademarks owned by the Canadian Automobile Association and used with permission. ® Registered trademark of Recipe Unlimited Corporation and its affiliates.